Federal government and Canadian Red Cross officials descended on the remote James Bay community of Attawapiskat Tuesday as Prime Minister Stephen Harper vowed to look into the community's housing situation. Federal government and Canadian Red Cross officials descended on the remote James Bay community of Attawapiskat Tuesday as Prime Minister Stephen Harper vowed to take "action" on the community's housing situation. The northern Ontario First Nations community has been receiving a flood of attention after declaring an emergency a month ago over its housing crisis. Many families are living in uninsulated shacks and tents or abandoned construction trailers. Harper said the government has spent "some $90 million since coming to office just on Attawapiskat. "That's over $50,000 for every man, woman and child in the community," he said during question period. "Obviously we're not very happy that the results do not seem to have been achieved for that. We're concerned about that, we have officials looking into it and taking action." Is Red Cross aid to Attawapiskat an embarrassment for Canada? Take our survey. Interim Liberal Party Leader Bob Rae shot back, saying the government's response suggests that Attawapiskat is at fault for their problems. "That response is a disgraceful response from the Government of Canada," he said, calling the situation an "embarrassment" to the country. Harper responded, "The Liberal Party's suggestion of simply throwing money is not the solution. This government has made significant investments, it's taken its responsibility seriously … we will make sure we get the results we need." The heated exchange comes as the Canadian Red Cross, which is leading efforts to help Attawapiskat, and interim NDP Leader Nycole Turmel arrived in the Ontario First Nations community Tuesday. 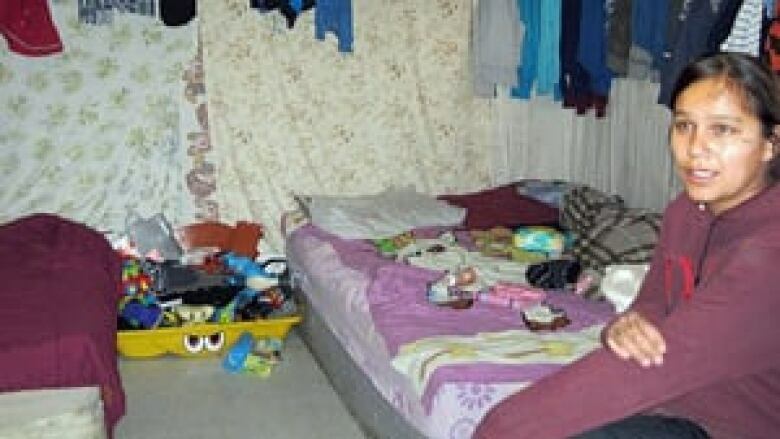 Turmel told CBC News she was "upset" by the "unacceptable" conditions she observed, with as many as 100 people living in a trailer and others living in shacks without heat or running water. "I am upset at both governments, at both federal and provincial governments... for not taking any action to ensure that those people live in a decent place," she told CBC News in a phone interview from Attawapiskat. "This is unacceptable in Canada." The National Chief for the Assembly of First Nations Shawn Atleo told CBC News Tuesday the situation in Attawapiskat was a "moment of reckoning." Atleo said the relationship between the government and First Nations must move beyond the Indian Act to a full partnership to better serve these communities. "In 2011, in a first-world, developed country like Canada, we should collectively say this is a moment when we will smash the status quo. We need to work with First Nations to develop systems for infrastructure, water, for health, for education." In the short term, he called for the government to address the community's basic needs: food and shelter. "But most importantly, that the people of Attawapiskat, that they are listened to and that they are part of the solutions going forward," he told CBC News. The prime minister will meet with Atleo later this week. Harper wants to propose a larger meeting of aboriginal leaders — to discuss education, economic opportunities, and financial accountability. A cargo plane with a shipment of aid from Canadian Red Cross also arrived Tuesday, carrying mostly heavy winter sleeping bags and heaters to be distributed to community residents within 24 hours, said the CBC's Adrienne Arsenault, reporting from Attawapiskat. "It's –15 , –20 [degrees] with no heat and a wooden shack", said John Saunders, provincial director of disaster management for the Canadian Red Cross in Ontario. "Those are pretty urgent needs. This is what we're trying to address. How do we take care of these people immediately." Attawapiskat Chief Theresa Spence said Tuesday she was "relieved" the Canadian Red Cross had arrived with supplies to help families immediately. "People are still living in the tents and the sheds, and some don't even have heat ... We're still in crisis at the moment. We are working on the immediate needs right now," she told CBC News. When asked about Harper's comments that the government would look into the millions it has given Attawapiskat, Spence said, "What will they investigate?... The money we get, 80 per cent goes to education and 20 per cent goes to the services that we need in our community." Spence called on government officials to provide adequate housing immediately. "We need the government, you know, to come and step in and really work on the situation. We need housing immediately and infrastructure to be improved. That is one of the major problems." Regional Grand Chief Stan Louttit and health professionals will also visit the community of 2,000, which has expressed an urgent need for generators, heaters, insulated sleeping mats and winter clothing. The government has done little to solve the problems faced by northern Ontario Aboriginal communities, said Bob Lovelace, a global development studies professor at Queen's University and a retired Ardoch Algonquin First Nation chief. "What is happening in Northern Ontario is a humanitarian disaster in slow motion. I strongly believe that what we see in the north is constructed famine in housing and food security," said Lovelace. "The government talks a good talk about developing northern communities’ local economies and education, but it’s just not happening." Federal and provincial officials arrived in Attawapiskat on Monday to assess the community’s problems. "The good thing is, everybody knows about it. The government is embarrassed as hell," Louttit said. "We're beginning to see some progress." The regional grand chief said five families living in tents should be able to move into homes before Christmas. Federal funding has allowed the Cree band to start repairing several houses that had been abandoned because they were too rundown. But Louttit said the chronic overcrowding, poor construction and poverty persist still need to be addressed. "This is Band-Aid stuff," he said. "It doesn't deal with the overall issue." Homes built on top of permafrost have extra challenges, said John Beaucage, a former grand chief who advises Ontario on improving aboriginal living conditions. Large families heat up the homes and melt the permafrost underneath, he said. Foundations and beams sink and then crack, and mould infestations spread. The substandard and overcrowded housing is affecting the health of people in the community. Dr. Heather Ringrose, who has treated many residents of Attawapiskat in her 17 months as a family doctor in the area, told CBC News that she often sees skin conditions linked to the lack of clean running water. "Every time I’m up here I have to deal with skin infections, cellulitis, and I have to drain skin abscesses. And I see a lot of MRSA, which is a type of skin infection that is resistant to typical antibiotics.… A person who doesn’t have running water in their home has a harder time of keeping clean and … to get rid of an infection once it is in the early stages. "I have patients who come to me every week asking me as their physician to write letters to the band office to try to get them better housing … they tell me there is a five-year waiting list for housing." The CBC’s Adrienne Arsenault, reporting from Attawapiskat on Tuesday, said that two years after a sewage spill destroyed homes, residents are still living in portable structures. "You have about 90 people living in these portables, sharing about six bathrooms. It is not comfortable, it is not particularly safe, it is not warm, it is not big enough. "There are kids in here trying to get ready for school … and the school is sub-par and a horror to the people here. They really have not had a school, one with lockers and a hallway and a gym for about nine years. The only one they had was built on a massive diesel spill. Kids were sick. Some were losing consciousness. The school was eventually torn down.… In the interim the kids are going to school in a portable." The First Nation's financial statement from 2010-11 says it's $11.3 million in debt. Attawapiskat isn't the only First Nation that has problems keeping up its infrastructure. The James Bay communities of Kashechewan and Fort Albany declared states of emergency along with Attawapiskat a month ago. A recent federal evaluation of First Nations housing concluded that the shortage on reserves in Canada is severe and getting worse. According to the February 2011 report, 20,000 to 35,000 new housing units would need to be built to meet current demand. First Nations leaders and the federal opposition argue they simply don't get enough funding to run their communities. Tom Flanagan, a professor of political science at the University of Calgary, says the crisis should be prompting a discussion about the viability of remote reserves. "Typically it gets framed as a question of: Is the federal government sending enough money? Well, you can't send enough money, it's not possible for the federal government to send enough money to deal with all the problems that will arise in a community where almost nobody has jobs and the local government is incompetent to manage all that money," said Flanagan. "Even if you do send several million dollars suddenly and bring in crews and they build all this housing, well, I predict that 10 years later similar problem would arise, if you haven't changed anything else in the meantime." P.O.V. : Is Red Cross aid to Attawapiskat an embarassment to Canada?